Dr. Sameena Zahoor was born in Wales, United Kingdom, after her parents Shaheen and (the late) Syed Masood emigrated there from India. Her parents and 3 siblings then moved to Michigan in 1987, where she finished her high school education. Dr. Zahoor attended the University of Michigan in Dearborn, for her undergraduate education and received her medical degree from Wayne State University School of Medicine in 1997. She then completed her Family Medicine training at the residency program in Oakwood Hospital and Medical Center in Dearborn, Michigan. Dr. Zahoor believes that her faith helps her to balance work, family, and personal well being. Dr. Zahoor is currently working in a private clinic in Canton. She believes that establishing and maintaining open and honest communication with her patients is essential to keeping them healthy. In addition to her involvement in various community based charity projects, she is a regular volunteer at the Hope Clinic, a free medical clinic in Wayne. 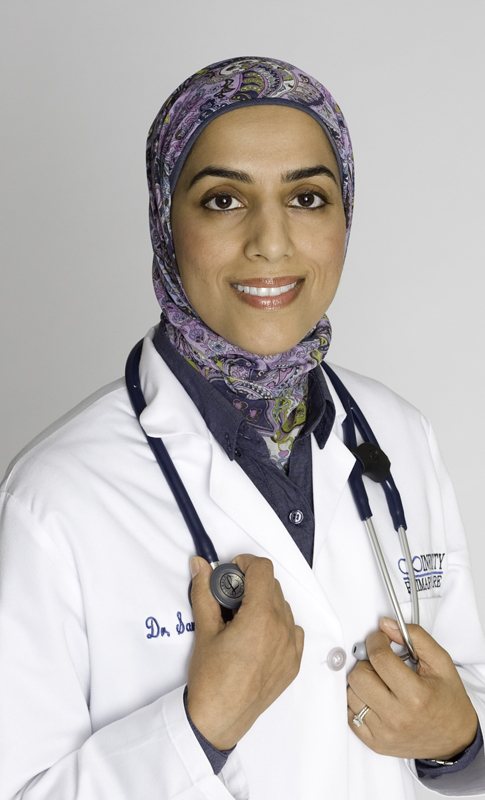 Dr. Zahoor believes that her faith helps her to balance work, family, and personal well being. Her personal interests include: Islamic studies, sewing, scrapbooking, photography and painting. She currently resides in Canton, Michigan, with her husband Murtuza Zahoor, and their 3 boys. Register for A-OK Service Day!